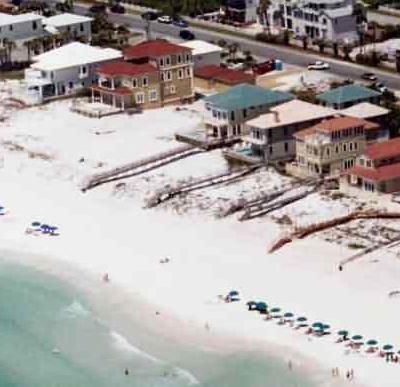 Crystal beach has lots of destin area vacation homes and vacation condos for rent. This community is an easy drive from destin shopping and restaurants, but there are quiet a few restaurants nearby, and there are also a couple of large shopping centers, and an outlet mall within a few miles of this community. You will also find waverunners, parasailing, and hobie cat rentals nearby. The beaches of south walton county begin one mile to the east, and continue for 27 miles eastward. For a great vacation package try our new All Florida Hotel Directory and booking service. The hotels are listed for every city in florida that has a hotel, complete with prices, and a reservation service. You will also find nearby businesses, and points of interest in the area. Book Discounted Condos & Hotels in Crystal Beach On TripShock.com Today! As you can see There are several architectural styles, and many different sizes of homes on Crystal Beach. The luxury vacation homes are sometimes a bargain, as several families can rent one of these and divide the cost. This can result in a real bargain for the individual families. Think family reunion. As you can see here, Destin gulf front vacation rentals are plentiful at crystal beach. For your convenience, the listings are separated into two catagories, on the beach, and near the beach Just click the appropriate button to see the listings in that category. We are trying to have the distance from the nearest beach access given with each listing. Crystal beach is conveniently located for shopping, restaurants and fun things to do. You can enjoy jet ski rentals and parasailing at crystal beach. You will have to drive into destin for deep sea fishing, and dolphin cruises, but it is a short drive from crystal beach. You are near several large shopping centers, restaurants, and even the local hospital. Even with the convenience you still have the feeling of remoteness once on the beach.